Angela Perkins (right) talks strategy with Laurel Johnson (center) and Kellyn Bechtold (left). Tough Army veteran Angela Perkins cried when she saw her daughter Paige visit "Survivor: Ghost Island" on Fiji during Wednesday's episode. Perkins, 42, of Orgeonia sobbed as she hugged her daughter, 22, a Clinton-Massie High School graduate who attends nursing school near St. Paul, Minn. Perkins told host Jeff Probst how difficult it was to leave her family when she deployed to Iraq (2003-04) and Afghanistan (2011-12). Angela Perkins on Fiji during the "Survivor: Ghost Island" taping. Credit Robert Voets / CBS Broadcasting Inc.
"While I'm proud, I'm also hurting because I'm leaving my family behind. You sometimes feel that you left them down. But then you see this amazing young adult, and everything she has grown to be. My family is really the hero in all this for me," she said. Perkins, the oldest contestant, didn't fare well in Wednesday's episode -- although she remained in the game with two weeks to go. She is one of seven (from 20) contestants left vying for the $1-million prize in the May 23 finale. She finished last in the reward challenge in the first part of the show, and second-last in the immunity challenge. An attempt by the women to gain control of the game by voting out one of the men (Wendell Holland of Philadelphia) failed. Instead the men voted out Chelsea Townsend, 24, a Salt Lake City emergency medical technician who had won several challenges. Perkins and her original Naviti tribe hold a 5-2 advantage over Malolo tribe members. A one-hour episode airs next Wednesday May 16 (8 p.m., Channel 12, CBS), before the two-hour conclusion 8 p.m. Wednesday May 23. Perkins, who retired as an Army captain, works for the U.S. Department of Veterans Affairs mostly from her home in Oregonia, in rural northeastern Warren County near Fort Ancient. When I spoke to her in March, she compared her 'Survivor experience to Army life. 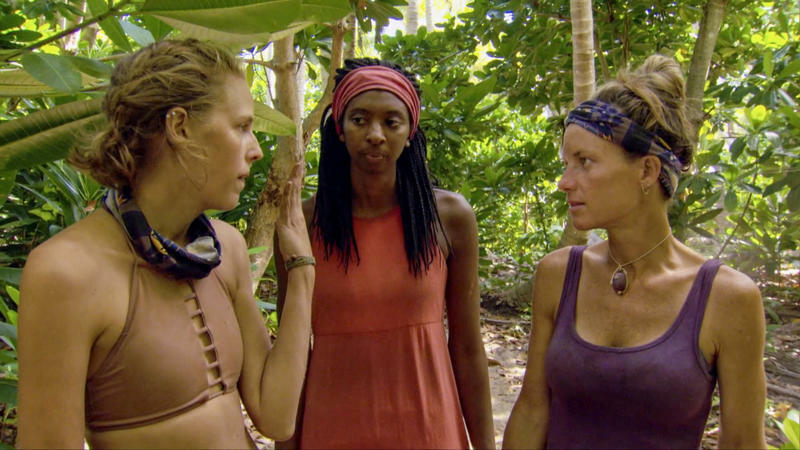 How Far Can Angela Perkins Go On 'Survivor'? Eight left on the island. Three "Survivor" shows left. How far can Oregonia's Angela Perkins go? Can she win the $1 million? Michele Crowe / CBS Broadcasting Inc.
"They are two different experiences. I would say it was more difficult for me to do 'Survivor' versus the war, but in a different sense.